The Butler's Pantry Buffet 4-pc Place Setting + BONUS bears beautifully sculpted accents. 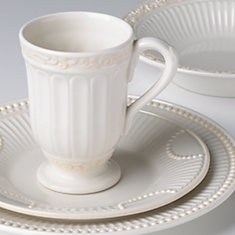 From the scrollwork on the bowl and mug to the raised dots on the accent plate to the fluting on the dinner plate, this dinnerware reflects artistry and craftsmanship. Diameter of dinner plate: 12", accent plate: 9", bowl: 9 1/2", capacity of mug: 16 oz.